You are here: Home / Snapshots / How are your holiday biorhythms? 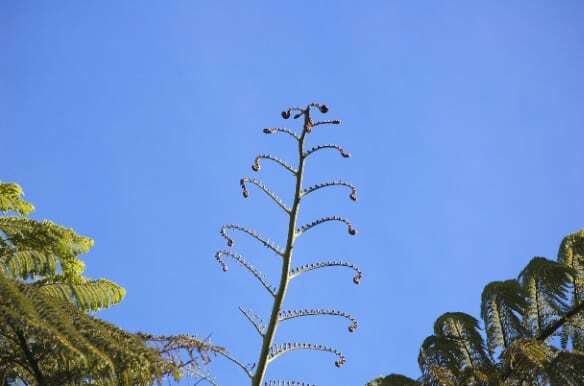 I spotted the Christmas Tree Fern from our Christmas Day walk, it’s like kiwi nature is making that connection to those pagan traditions of Christmas we so enjoy. It was a gloriously clear blue sky on Christmas Day and this is an image to hold onto as I look out of the window right now and see the grey cloud and strong winds blowing the trees. I knew it was too good to be true – summer has not quite arrived! It’s notoriously hard to capture an attractive picture of a basset on the run. You’ve got to admire Fortnum’s exuberance though. He loves to run even if his jowls and wrinkles bob about in an unseemly way. Mason is less of an athlete but he his ears swing rhythmically as he saunters along. 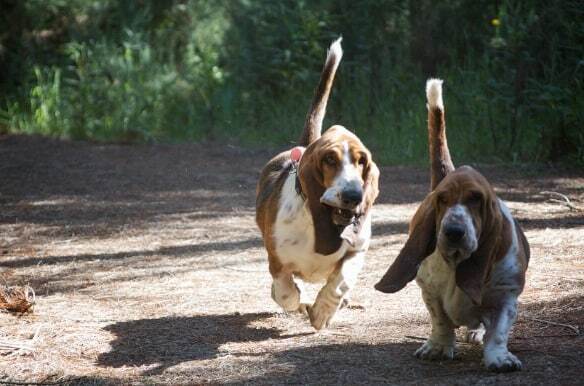 There is no doubting these are two happy bassets out for a romp in the sun which they tails pert and upright – a particularly pleasing sight for little basset after the mishap with his tail. One of my favourite pastimes when I lived in the UK was playing golf. I thought moving to New Zealand I’d have so much more time to play. It’s been a source of great frustration that I’ve not lifted a club more than once at the driving range in the time we’ve lived here. Deep down I know that it’s not the time available that’s been putting me off but rather the prospect of being broken in as you join a new club. Kiwi golf clubs are much more laid back and I’m sure very friendly but the challenges of joining a golf club in the UK are still raw and painful to me. My golfing career was nurtured by my in-laws and my friends Clare and Geoff. They couldn’t have been more supportive and whilst I know that everyone has to start somewhere but I still cringe at the awful shots that made me wish for a bunker to open up on the spot and swallow me up (which of course happened on a regular basis!). 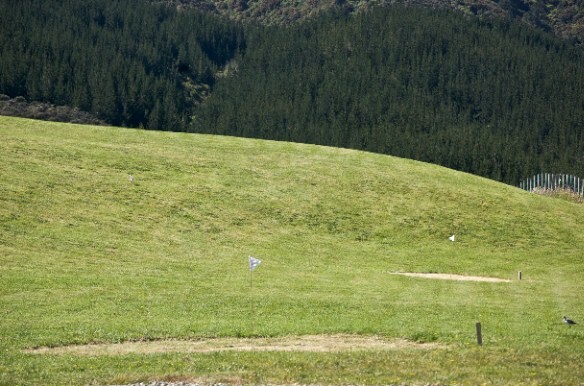 I’m delighted to see my neighbours have set up their own pitch and putt on their land. It’s brilliant and is complete with short green around the “hole”. It has made me realise how much I enjoyed golf and given me more determination to hook up with them to take the plunge and get back into golf. That’s if the mice haven’t eaten my clubs which are gathering dust in the barn. There is nothing that gives more pleasure in our house than a pile of Christmas books. The chocolates, smellies and DVDs are much valued but it’s the books that really have pride of place. There is nothing better than kicking back with your feet up and luxuriating in the almost limitless time you have to read. This is my pile for this year and they are perfect choices for me. This pile of books will give me inspiration for writing, growing, cooking and photography. All those things I am learning and loving. I’ve got shelves of “how to” books but these books will inspire me to experiment, to learn for myself. To create my own appreciation and better understanding of what works and what doesn’t. They’ll give me the courage to do things my way – however badly that might be to start with. As I complete this post I can feel that holiday spirit slipping into sight. Whatever the weather and wherever our loved ones are, it’s time to relax, to kick back and get into those things I want to do, not need to do. Now there’s a novel thought! 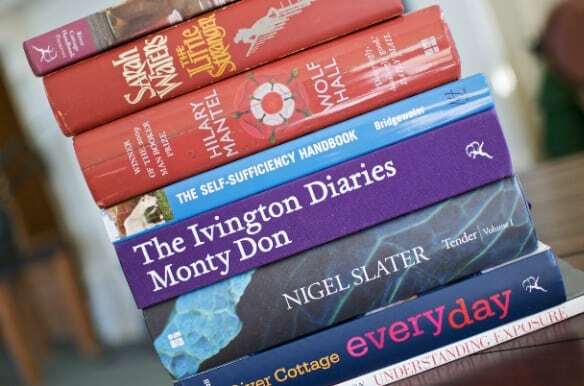 Ah, books are my favourite gift too and I have a nice new stash on the bedside table.